Sonata is an adorable BYOB in Liberties Walk. When I say adorable, I really mean it. Both E and I could not get over how cute the space is. I mean it’s pretty much just clean and simple, but also totally cute. It seems like a fairly subdued place, but the night we were there there was a very large birthday party table so it was a bit noisy from their festivities, but that doesn’t seem standard. And I love the music-related name. Their menu changes seasonally and is very small. In fact, it’s probably changed to the spring menu by now. I like the small menu because I don’t have to waffle between too many choices. We did get some help from our awesome server on some of his recommendations. 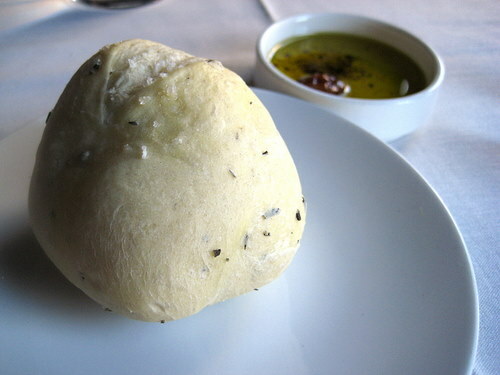 Freshly baked complimentary bread. It was warm, delicious, and herby. We got the crispy pork belly as an appetizer. 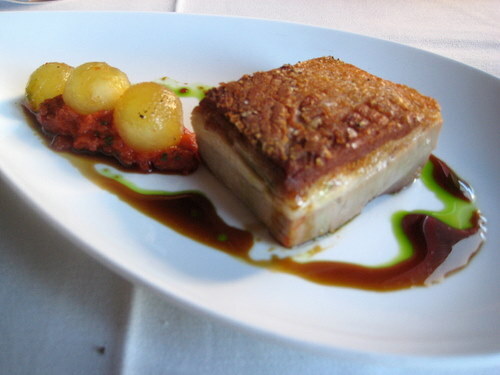 It is a giant and thick hunk of pork belly with a thick crispy skin with smoked tomato marmalade, compressed apple, and calvados molasses. Holy crap, this thing is just awesome. I mean pork belly in an of itself is awesome, but then you put all this other stuff with it and damn, I just can’t tell you how good this is. And it’s so damn pretty, too! E got the cod entree. 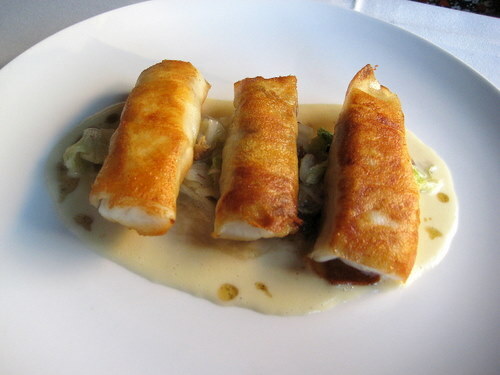 There are three pieces of potato wrapped pacific cod on napa cabbage and hedgehog mushroom in a sweet onion cream. The fish was super fresh and cooked perfectly and E could not get over how much she loved the cabbage. I was also pretty crazy about my entree, the chicken. 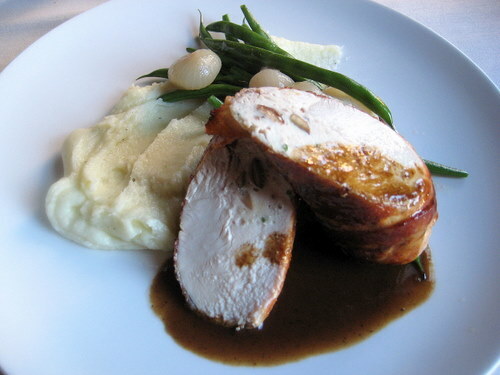 It was a pan roasted bacon wrapped chicken with chestnut stuffing, bourbon whipped potato, haricot vert, and glazed cipolini onion. First off, the chicken was beyond tender, having been pounded, but then once wrapped in oodles of butter, it gets even more tender and beyond juicy. I love chicken that melts in your mouth. The potatoes were great, the green beans were just crispy enough, and I love the cute little onions so much that I wished the plate was full of them. 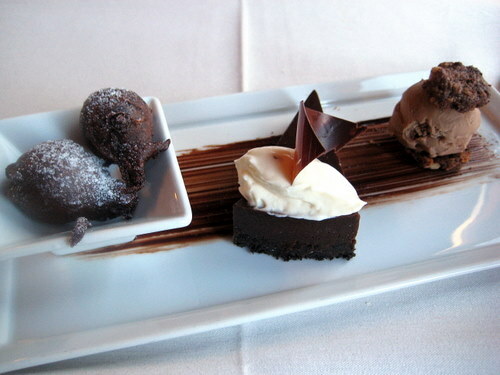 Ok, onto the dish that E loved the most… her dessert! It was basically a trio of chocolate goodness – warm chocolate beignets, chocolate decadence, and a chocolate hazelnut chipwich. 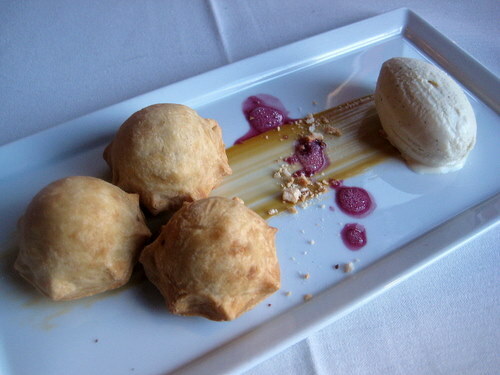 Ok, so these beignets, they were warm and had ooey gooey chocolate on the inside. Like seriously. And she pretty much wanted to marry this chocolate decadence. I got the apple pie for dessert, only these were adorable little mini fried apple pies with vanilla whiskey ice cream and caramel sauce. These were so cute and tasty! The ice cream was pretty intense… I thought to myself “it’s like vanilla, only with extra awesome.” Then I realized that the awesome was whiskey. 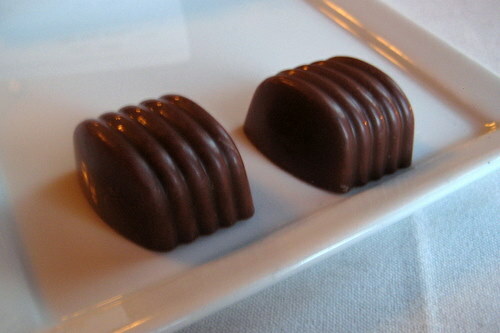 And with our check came these homemade chocolates with caramel and sea salt. Yes, they were as good as the rest of the meal. 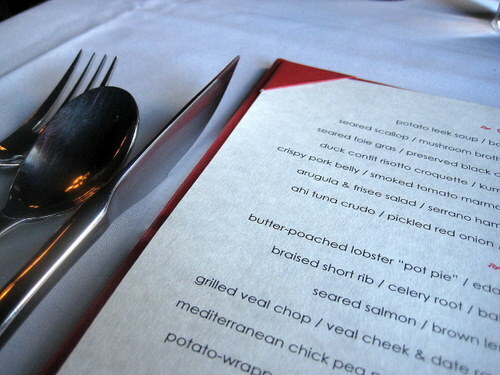 E and I both loved our meals at Sonata so much that we can’t wait to go back. Not only was the food perfect, the service was excellent. Everything was just spot on. Even the executive chef, Mark Tropea, came out to check in with us after our meal. We felt so honored. We can’t recommend this place enough!